Just groom your lovely pet with Petacc slicker brush! never hurt your pet's skin, perfectly clean the hair and massage your lovely pet at the same time. Long Comb Teeth- Well made of superior stainless steel, capable to remove loose hair, stimulate hair follicles and promote blood circulation. Easy to Clean- Just need to press the rubber, the hair on the brush will be removed. Ergonomic Handle- Anti-aging and non-slip, extremely comfortable to grip, effectively avoids fatigue and sore hands. Must-have Brush- Great for grooming your cats, dogs and other pets, also ideal for eliminating tangles, taking a shower and massaging. 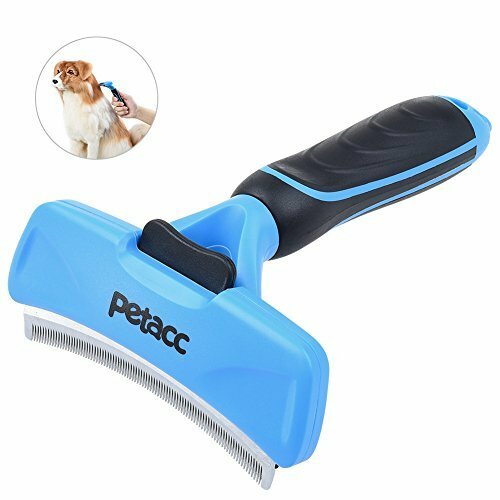 Brushes for Dog Cat Pet Grooming Brush and Self Cleaning Slicker Pet Hair Removal Brushes 2 in 1 Combo,Removes Dog Fur, Cat Fur and Lint from Dog,Cat,Clothing, Furniture Upholstery.